When 2013 began I had NO idea what was in store for us. We had only been home for 2 months after Hailey's tube was placed and she was in an almost vegetative state. She wasn't talking, she wasn't walking, she was diapered but she was able to communicate by smiling and she could also shake her head no. For those of you who have followed our story this will be a year end review, for those of you who are new this will be a lot of info in a short post. Once January came along I had told Josh that after 2012 and all of the hospital stays and all the tests and pokes and blood draws I wanted OUT! Out of the city, out of the state, out of hospitals. I needed to take Hailey somewhere happy. What happier place then Disneyland? The beginning of February we took a family road trip to California and even though Hailey was in a wheelchair and was taking her tube feeds with us where ever we went we still enjoyed every moment. Especially when my little sister surprised us with her and my niece for a whole day. We took the girls to get princess make overs and took TONS of pictures! February was the first time Hailey looked at food and didn't shutter away from it. I gave her tastes of my soups and she liked it. It was a great sign of things to come. In November of 2012 I remember getting a letter in the mail that was from the Make a Wish foundation. It was a proclamation announcing Hailey would get her wish granted. You don't know how real your child's terminal disease becomes until you read those words. 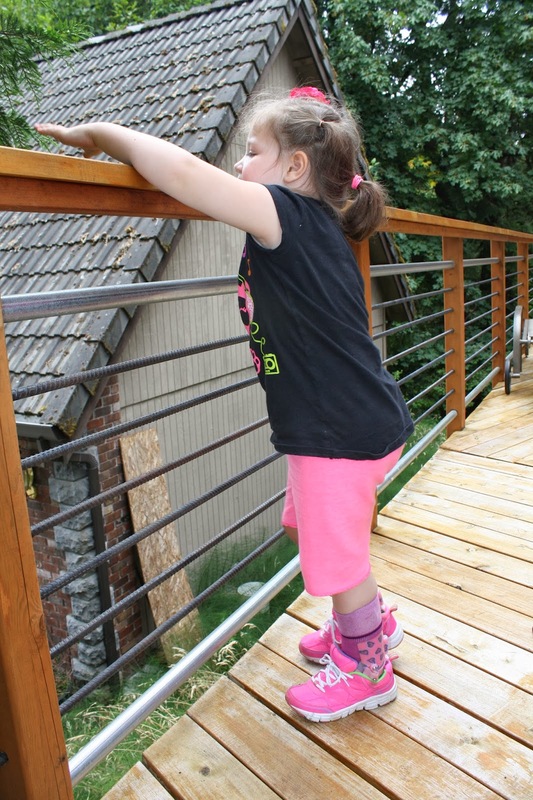 Even before then I couldn't yet say the words, "my child has a terminal disease." without bursting into tears. I almost didn't want to get involved in the whole Make a Wish process. It turns out it that was one of the best decisions I've ever made. We met with our Wish granters in February and our two choices we had was to either go to DisneyWorld and stay at Give Kids the World or go on a Disney Cruise. I ended up making picture boards and Hailey picked the board with DisneyWorld on it. I even posted the video on this blog of her making the choice. The Make a Wish trip was the first time we had traveled since Hailey had been diagnosed. It was quite the adventure packing for a whole week and having to take so many medical supplies with you. Feed bags, formula, syringes, gauze, tape, diapers, and medications. I must have rechecked my list 20 times to make sure I didn't forget anything. We had a GREAT time at Give Kids the World and DisneyWorld. Universal Studios went above and beyond. We also appreciated that Hailey's Grandparents, Great Grandparents and Uncle and Aunt that had joined us on our trip. Getting back from our trip is when we started Physical, & Occupational therapy and when I started looking for a place to take Hailey for HippoTherapy (therapy on horseback). In March I had taken the Hugs for Hailey's necklaces to a craft show for the very first time, sharing Hailey's story with complete strangers. Hoping to boost our Facebook numbers and spread awareness of my brave daughter. I may not know why others can get 40,000 likes on their child's page while I still have barely under 1300…but I will continue to try to get the word out of our story. While at the craft fair I was introduced to a woman to sold DoTerra essential oils. She was so nice to answer any and all my questions. The bottom line was that the Doctors were telling me there was no more that could be done for Hailey. If I tried using essential oils there would be nothing to lose. I read as much as I could about it and she even gave me some oils to use free of charge. I have a whole other post coming up about essential oils. It'll be posted in the next couple weeks. May was Hailey's birthday month where she turned 5 and I was determined to go BIG! Hailey wanted a Princess and pirate birthday party and I was excited to plan this for her. At this time she wasn't yet sitting up on her own but she was trying to communicate more. So many people helped celebrate Hailey's birthday. We even had the owner of Happy Thoughts Bakery donate a Princess and Pirate cake! Lots of family came to celebrate. Hailey's birthday happened to land on Mother's day and it was a great present for me. In May we were excited to be asked if Hailey could attend a Fundraiser in her honor. 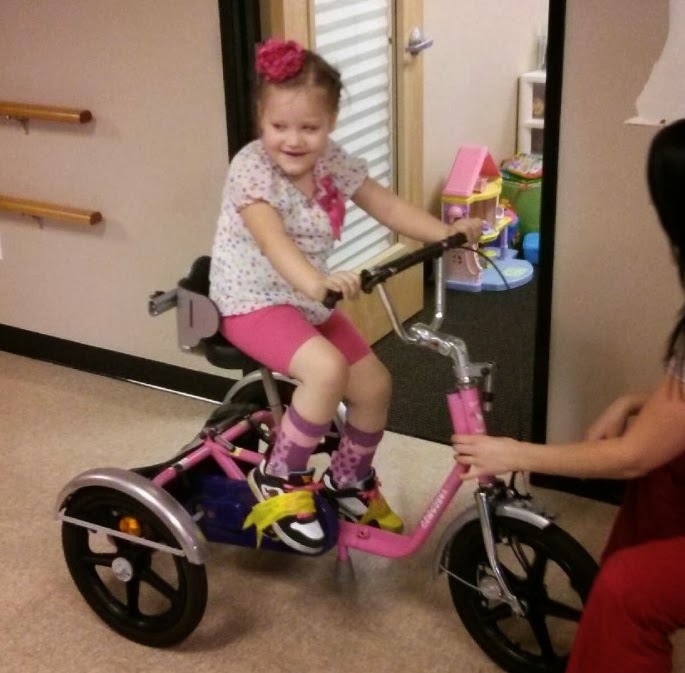 The fundraiser was given by Hailey's Nucca Doctors at Spine Wellness Center. There was face painting, a bounce house, great food, a visit by the fire fighters, and a great silent auction and raffle! We love Dr. Sarah and Dr. Lisa for their continued support for Hailey. By this time Hailey was lifting her arms up and she was speaking 2 words at time and was closer to sitting up on her own. She was able to sit up for longer and longer moments at a time. In June Hailey had surprised us all when she started crawling! Now she was sitting up on her own and she was crawling. Things were going SO well!!! Then about a week after all this progress Hailey had another episode and we were back to square one. Hailey would vomit and have endless spasms. She couldn't sit up, she couldn't crawl. I continued to put Hailey through therapy then I got a phone call that Hailey was accepted at Spirt Therapies for Horse Therapy. I was excited and worried at the same time. Hailey couldn't sit up, how was she going to ride a horse? But we decided to go forward. Hailey's episode lasted about 3 weeks. She started taking Zofran just so that she would stop vomiting. The first lesson at Spirit didn't go so well. Hailey screamed and cried and I didn't know if I should just stop and take her home. Ms. Laurie the therapist assured me that 9 times out of 10 the child will cry at least for the first few lessons. She encouraged me to give it a chance and I'm glad she did. July started great. After her episode Hailey went back to where she left off! She sat up again and was using her arms and she had started to slim down from all the work she was doing. I had put Hailey in Summer School and towards the end she was barring weight on her legs. It was amazing to see her vertical after so many months of just lying on her back staring off into space and crying. After a whole month of Summer school we celebrated Hailey's Pre-School graduation with a big party combining her graduation with Joshua's Birthday. The cousins were in town and it was time to celebrate! Hailey had completed her first 6 week lesson at Spirit Therapies and we were so proud of her. The very last lesson of the session and Hailey was all smiles and no tears. We love Spirit and the wonderful people we've met through it. August was the end of the summer months and we decided that we should take Hailey to Washington state to visit Josh's side of the family and I am sure glad we did. We had SO much fun. 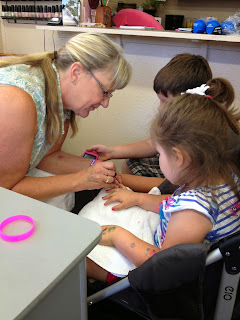 Hailey and I were given manicures and Hailey's Grandparents spent a lot of quality time with her. One night as Josh and I went out for a MUCH needed date night we come home to Josh's mom saying the words, "Hailey took 4 steps on her own tonight!!" I didn't want to cry but I could feel my eyes stinging with tears I was fighting back. SHE WALKED?! 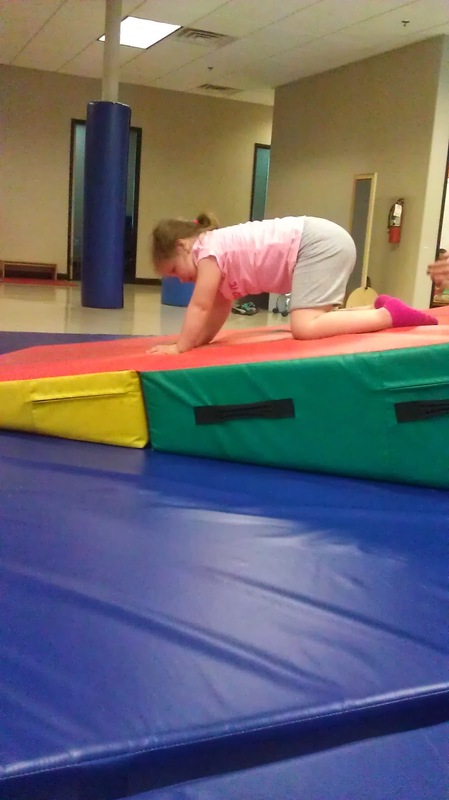 The doctors told us the chances of her ever walking again were slim to none. I've learned to take what Doctors say with a grain of salt. With every one of Hailey's episodes she'd crash and come back. Every time. Why I thought this time would be different makes me upset that I doubted Hailey. September we were very excited to have Hailey start Kindergarten! Well, excited and terrified at the same time. At least for me. Hailey would be starting full day kindergarten and I had made sure that everyone was going to know who I was and who Hailey was. Hailey LOVES school and her teacher is great. At this point Hailey knows 22 out of 26 letters of the alphabet! We were invited by the Make a Wish foundation to attend Make a wish night at the baseball field to watch our local Las Vegas 51's play. It was such a fun night and meeting new make a wish families is one of my favorite things! September we decided to continue with hippo therapy at Spirit and Hailey was thrilled to go back and visit "her horse" Pablo. Hailey had made such amazing progress. 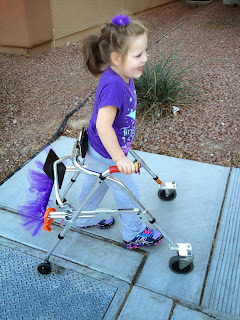 She was taking more and more independent steps and even standing for long periods of time. We were invited by Sam Boyd Gaming to go to Disney Junior Live and we were even offered a meet and greet with two of Hailey's favorite mice. October was a busy month for us! I went down to Hailey's school and took some pictures of Hailey having some exciting fun on the playground. Her favorite thing to do is go down the slide! We had 2 events in one day and first up was a wish wall dedication at the Make a Wish Offices. Our wish coordinator hadn't seen Hailey since February and to see her in October and walking kind of threw her for a loop! Then after that we headed to a fundraiser for Spirit Therapies. Everyone there, especially the volunteers, have seen the progress Hailey has made. We appreciate the volunteers so much. Without them Spirit couldn't run as smoothly as it does. October was also Physical Therapy Month. I entered an essay on behalf of Children's Therapy and Hailey and we ended up winning first place! Hailey got an iPad mini! Then lastly in October after a full month of voting we won the 10,000 Reasons to Save essay contest! We could not have won this essay without the help of our family, friends and readers of this blog! November was another special month for us! We had the opportunity to be a part of another event for the Make a Wish foundation. Rally car driver Tanner Foust spent the morning with 3 very special wish kids. This was an amazing event and Tanner was very generous to eat breakfast with the kids, take them for a spin in the rally car, and have them spend the day in his suite! 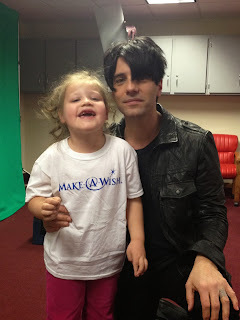 Another great person we met was a fellow wish child by the name of Amanda! Hailey and her have become Best Friends! To close out the month of October Hailey and her cousin spent Halloween together and my little Super Girl had done a complete 180 from last year! In November I signed Hailey up to be paired up with a runner who would run on behalf of Hailey. The runner we were paired up with could not have been a more perfect match for us. Katie was assigned to us and she has done 5K's and Half marathons already. She sends Hailey the medals that she gets and Hailey hangs them up in her room. Having someone do something on Hailey's behalf is pretty amazing. Thank you Katie for running for Hailey! Another special person who has given Hailey a great gift, is a little girl that attends the same Physical therapist as Hailey, she donated her old walker to Hailey. Amazing generosity. This Thanksgiving we had a LOT to be thankful for which may sound ridiculous coming from a parent of a terminally ill child. Hailey was able to sit at the Thanksgiving table with us as a family this year. We also met local celebrity Criss Angel and participated in a Christmas PSA for the Make a Wish Foundation. I posted the PSA on our Facebook page and we will keep it on the DVR as long as possible! Before the actual act of Christmas began we had a lot of things on our to do list. First up was a cardiologist appointment in Utah. This would be the first time that Hailey was to be able to play in the snow and she LOVED it! Then after the Dr. appointment we headed down to Tuacahn and took some silly pictures. It was a lot of fun having a little family weekend out of having to be in Utah. We also attended the annual Make a Wish Christmas Party and that was a BLAST! Loved it! Every year before Hailey got sick we'd go to Washington for Christmas. The past 2 years we were not able to go. This year we decided it would be a great idea to go. We had a lot of fun. It was great to see Hailey so happy. So that was our year. I had no idea what was in store for our family in 2013. I can honestly say it was a good year. We've stumped our Doctors and we've lived life how we've wanted to. We did everything we could to give Hailey the quality of life we would have if she wasn't sick. We want to thank everyone who has helped us by supporting our blog, Facebook page, and twitter. The people who have continued to share our story and our Hugs for Hailey necklaces. People who don't know us personally, who email me and ask if there is anything they can help me with or just to tell me they are thinking of us. 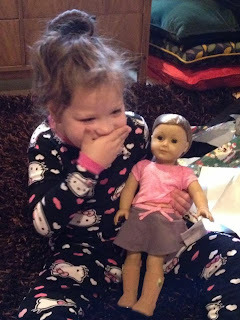 People who have sent gifts to Hailey just because they thought she'd like it. I think that means the most. There have been so many friends that I feel like I have lost during the time I've needed friends the most. There are also friends who have stood by me and kept on me when I shut down and didn't ask for help. Who didn't act differently toward me because I have a terminally ill child. Who didn't walk on egg shells around me. I appreciate that. Josh and I know that we can not do this alone, nor do we want to. We appreciate everyone involved in our journey. We don't know what is in store for us in 2014 but we do know that we will keep up this blog and Hailey's Facebook page. Happy New Year to you all and thank you for reading!! On our way to the TOP!! Why do I even have insurance?